Spend a week with What's Up TV producers and Sky professionals to learn how TV production works. Gain practical experience while producing a short video and hear what is like to work at Sky from a selection of guest speakers including Sherida Denny, Senior Accounts Manager at Sky TV. You will have the opportunity to visit Sky Studios and hear words of wisdom from inspirational speaker, boxing analyst and historian pundit Spencer Fearon. Who’s it for: 15 – 17 year olds living in Brent. What skills you will learn: Creating content which includes learning camera operating, lighting and sound recording. You will also gain an insight into media careers and ways to access the creative industries. Costs: The course is free. Travel & lunch is covered. 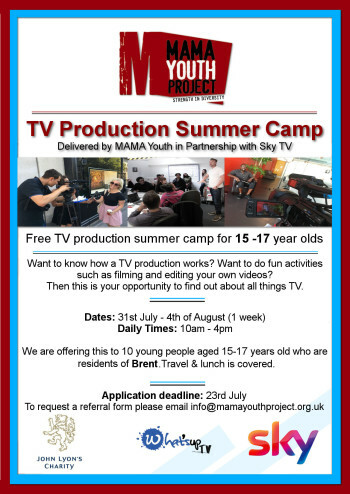 Apply: E-mail info@mamayouthproject.org.uk to request an application/referral form.